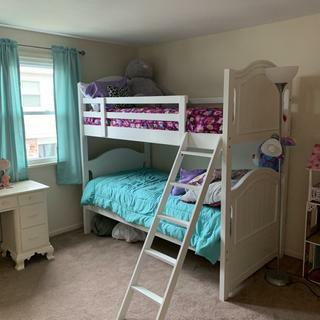 L: 75" x W: 42.5" x H: 79.5"
Willow Point Twin-Over-Twin Bunk Bed Make the most of shared bedroom space with the Willow Point twin-over-twin bunk bed. Its versatile white color coordinates with any design scheme, and stylish arched headboards and footboards with plank-style panels add a classic decorative accent. Make the most of shared bedroom space with the Willow Point twin-over-twin bunk bed. Its versatile white color coordinates with any design scheme, and stylish arched headboards and footboards with plank-style panels add a classic decorative accent. L: 75" x W: 42.5" x H: 79.5" Weight: 205 lbs. Chose this product because it seemed so sturdy as well as beautiful. It was delivered exactly on time and installed in no time at all. The bed is very pretty and my granddaughters love it. My main concern was safety of the bed and my expectations were exceeded. Very happy. The bunk beds are being used by my grandsons at a vacation home that they just loved! They are well made and very sturdy! This is a beautiful bunk bed! Seeing how expensive bunk beds can run I was kind of worried about quality. But these are GREAT. Very sturdy and they have a great warranty. This is not particle board, it's good quality. They delivered right on time and put it together in no time. I was honestly shocked at how quickly they were done. It would have taken us hours. Hoping this lasts us years to come. The perfect bunk bed set for my 8-yr-old girlie girl. She loves it! Product came a little defected but overall service was great . Can this bunk bed be converted to two seperate twin beds? BEST ANSWER: Yes, the beds can be separated. However, one of the posts will have exposed holes. The manufacturer does not make plugs to cover those holes. what is the distance between the beds. how much room is there between the botton bunk and the bottom of the top bunk? BEST ANSWER: Without a mattress there is about 35" of clearance. Can the ladder go on either side of the bed? BEST ANSWER: You would not be able to assemble the Willow Point Bunk beds with the ladder on the left side. It can only be assembled as shown online. What is the width of the each bunk? BEST ANSWER: The width of the bunk beds (without the ladder) is 40". DO THE MATTRESSES COME WITH THE BED ?